Hi, my name is Loreto and I am a Graphic Designer and I am available to provide computer tutorials to individuals and small groups. I am also involved in Adult Literacy Tutoring. I live just outside beautiful Listowel in North Kerry, Ireland. So what is Adult Literacy? In the past literacy was considered to be the ability to read and write. Today the meaning of literacy has changed to reflect changes in society and the skills needed by individuals to participate fully in society. I provide level 3 private 1-2-1 or small group computer lessons for students, adults and retired people. Level 3 is ideal for those adults who do not wish to be tested but still want to learn new skills. The lesson is assessed by work completed and computer skills demonstrated. “Do you have a busy business but your computer skills are slowing you down? Then don,t delay get in touch today.” Lessons Designed For beginners, more experienced users & everyone in between using Windows or Macs PCs. Lessons can be delivered in your own home at your convenience. I am a qualified professional with a proven track record and results guaranteed. Learn Basic Computers Skills for Beginners -The Mouse, Keyboard and Windows Environment..including Windows 7, 8.1 and the new Windows 10. E-mail – Windows Mail, Configure your desktop mail, Yahoo, Hotmail, Google Mail etc. File Management – Organising your files and folders with Windows Explorer. Scanners and Cameras – How to scan documents and photographs. Downloading photos from your camera. Uploading your photos to Facebook using your Smartphone or Computer Tablet. Graphics & Photo Editing – learn to brighten your photos, edit or chop your photos. Get the most from Social Networking – facebook, twitter, YouTube , LinkedIn etc. Learn How to Back up your Valuable Documents – more info. Making the most of Cloud Storage – Dropbox , One Drive, Google Drive etc.. more info. All lessons will include printouts with step by step instructions…. 2016: WIT Microteaching Module: Higher Certificate in Arts in Literacy Development. 2014: Registered with The teaching Council of Ireland in Further Education for adults in Information Technology in Education, and Interactive Media. 2010: (Level 8) Second Class Honours: MSc in Educational Technologies . My final year thesis is titled ” An investigation into factors that influence senior citizens in their uptake of IT Skills“. This thesis would not have been possible without the time and patience from members in the local ARGs ( Active Retirement Groups) such as Buds (Ballyduffs Active Retirement Group) and TARA ( Tralee Active Retirement Association). 2009: ( Level 9) First Class Honours: BA (Hons)in Interactive Multimedia from the Institute of Technology, Tralee. My 4th year project is an Interactive Animated Flash Book that can be played on any Computer. The Flash book is completely interactive and has speaking instructions and other related sounds). 2005: 11 Distinctions: Multimedia Productions (Level 5) at the Tralee Community College . –Adult Literacy through the Interactive Whiteboard. • Part-time Tutor with Access & Disability Student Support at Institute of Technology, Tralee, in Web Applications, Dreamweaver, Photoshop etc. • Freelance Computer Tutor & Graphic Designer specialising in murals & book illustrations. Free Online literacy resources can be found at my website KerryVolunteerTutors.Weebly.com on improving your spelling -to tips on getting the most out of your pc. I believes that self-reliance is a vital key to living a healthy and productive life. To be self-reliant one must master a basic set of skills. One of the most essential skills in today’s society is to have basic computer knowledge. People of all ages have to become increasingly reliant on computers, from communicating with friends and family members to computerised searching, shopping and accessing on-line information. I am available & trained to give step by step lessons on all stages of computer knowledge, with easy to read printouts. “Loreto has the capability to listen and respond to client needs on a creative level. She has produced work on my behalf which needed very little change so the finished product was done quickly. 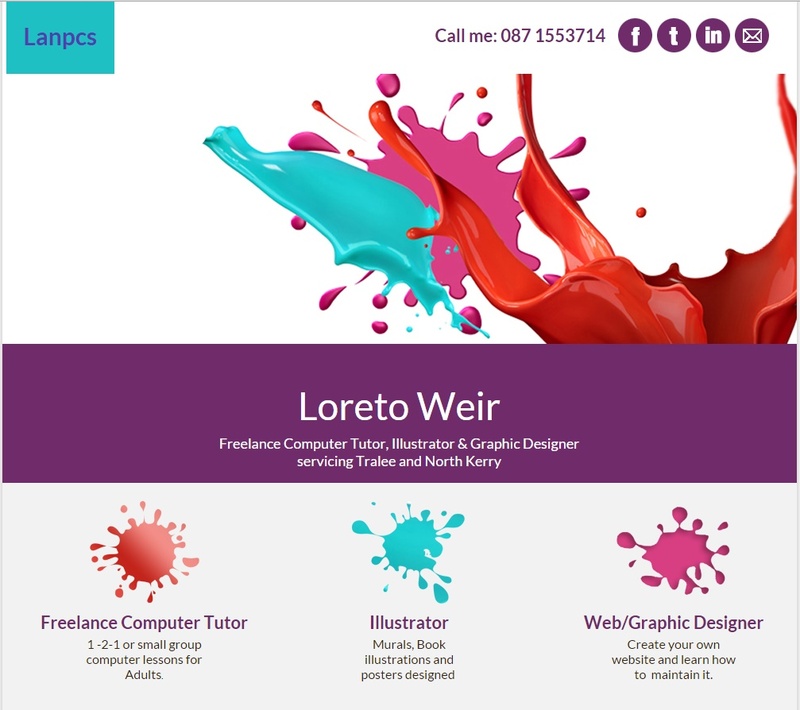 “Loreto is very creative and innovative in her work in multimedia and graphic design. She is a cheerful and outgoing person which shows in her work and i can guarantee her work is never dull. As part of my Masters I had to create Customized RLO tutorials (Reusable Learning Object) on any subject matter. RLO’s are multi-media files designed to help people learn what is usually a small chunk of material and are usually a stand-alone application. I have included a link to them on this page if anyone want to use them. These Flash Tutorials can be played either online or offline, please contact me if you would like a stand alone copy on a CD. These will not work on an iPad ( ps. Flash will not work on an Ipad). A break down of the individual flash files are below. Please go to my website Lanpcs.com for more tutorials on Laptop components and a laptop quiz. Click back on browser to return to this blog afterwards. PC Desktop Tutorial . This will open in a new browser window, Click back on browser to return to my blog afterwards. when you have finished the PC Desktop Tutorial try testing your knowledge using example b below. PC Desktop quiz : Use your mouse to learn all the components of a PC Desktop by clicking & dragging on the labels. Click back on browser to return to my blog afterwards. Please go to my Website LANPCS for a full list of Free Online Tutorials and other computer tips. Want to find your way around Windows 7/8, Vista, Microsoft Office 2007/’10 and previous versions of Office? Learn how to use the internet to its best advantage and how to email friends and family. Learn how to update your website using HTML and other tips. People learn in different ways and training is therefore more effective if it is tailored to the individual. 1:1 tuition is also the most time efficient way of training. Give a shout if you want some tutoring.